The Conference4me smartphone application provides you with a comfortable tool for planning your participation in FEC 2014. Access the entire programme from your smart phone or tablet. 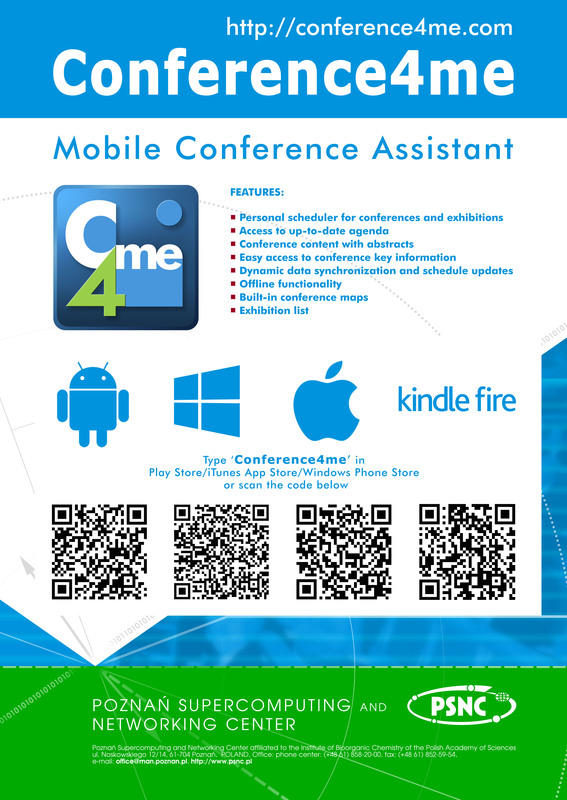 To download the application visit http://conference4me.eu/download or search for 'conference4me' in Google Play, iTunes App Store, Windows Phone Store or Amazon Kindle Fire App Store. The International Atomic Energy Agency (IAEA) fosters the exchange of scientific and technical results in nuclear fusion research through its series of Fusion Energy Conferences. The 25th IAEA Fusion Energy Conference (FEC 2014) aims to provide a forum for the discussion of key physics and technology issues as well as innovative concepts of direct relevance to the use of nuclear fusion as a source of energy. With a number of next-step fusion devices currently being implemented — such as the International Thermonuclear Experimental Reactor (ITER) in Cadarache, France, and the National Ignition Facility (NIF) in Livermore, United States of America — and in view of the concomitant need to demonstrate the technological feasibility of fusion power plants as well as the economical viability of this method of energy production, the fusion community is now facing new challenges. The way these challenges are addressed will dictate research orientations in the present and coming decades. The scientific scope of FEC 2014 is, therefore, intended to reflect the priorities of this new era in fusion energy research. The conference aims to serve as a platform for sharing the results of research and development efforts in both national and international fusion experiments that have been shaped by these new priorities, and to thereby help in pinpointing worldwide advances in fusion theory, experiments, technology, engineering, safety and socio-economics. Furthermore, the conference will also set these results against the backdrop of the requirements for a net energy producing fusion device and a fusion power plant in general, and will thus help in defining the way forward. The 25th IAEA Fusion Energy Conference is being organized by the IAEA in cooperation with the State Atomic Energy Corporation “Rosatom”, Russian Federation. Previous conferences in this series were held in Salzburg (1961), Culham (1965), Novosibirsk (1968), Madison (1971), Tokyo (1974), Berchtesgaden (1976), Innsbruck (1978), Brussels (1980), Baltimore (1982), London (1984), Kyoto (1986), Nice (1988), Washington DC (1990), Würzburg (1992), Seville (1994), Montreal (1996), Yokohama (1998), Sorrento (2000), Lyon (2002), Vilamoura (2004), Chengdu (2006), Geneva (2008), Daejeon (2010) and San Diego (2012). Papers on these topics will be considered for presentation at FEC 2014 if they are clearly relevant to the development of fusion energy (see the attached Annex A, Scientific Guidelines for Authors). A Programme Committee consisting of a representative international membership will be responsible for the selection of papers, the arrangements of conference sessions and the overall scientific content of the conference. The Programme Committee will meet in April 2014 at the IAEA’s Headquarters in Vienna, Austria, to finalize the technical programme of the conference. Please be aware that because of the large interest within some countries in submitting papers, official authorities in those countries may pre-screen the papers to be submitted. Authors are advised to acquaint themselves with possible deadlines for this process at their earliest convenience. All persons wishing to participate in the conference are requested to register online in advance via the IAEA conference website (see Section P). In addition, they must send a completed Participation Form (Form A) to their appropriate governmental authority for subsequent transmission to the IAEA. A participant will be accepted only if the Participation Form is transmitted to the IAEA through one of the established official channels (see Section H). Anyone wishing to present a paper or poster during this conference must submit a two-page synopsis and an abstract, both in electronic format (no paper copies), directly to the IAEA. Instructions on how to upload the synopses and abstracts to the conference’s web browser-based file submission system (IAEA INDICO) are available on the IAEA conference website (see Section P). The synopses and abstracts must be submitted through this system between 21 February and 21 March 2014. No other form of submission will be accepted. These forms must be received by the IAEA no later than 1 April 2014. Authors will be notified by email by May 2014 whether their papers have been accepted for oral presentation or for poster presentation and will be informed of the assigned paper number and presentation session. Specifications and instructions for the layout and electronic format of the full manuscripts as well as for the preparation of posters will be posted on the IAEA conference website (see Section P) by May 2014. The full manuscripts must be submitted through the IAEA-INDICO file submission system in the same way as the two-page synopses. IAEA-INDICO will be reopened for submission of accepted papers on 18 August 2014. The deadline for electronic submission of the full papers as PDF files is 21 September 2014. The IAEA will not accept regular papers submitted after the deadline, and any subsequent submission by email will not be accepted either. IMPORTANT: The system for electronic submission of papers, IAEA-INDICO, is the sole mechanism for submission of regular papers for FEC 2014. Historically, up to 70% of all papers for previous conferences were submitted during the last week before the submission deadline, which has led to some technical difficulties experienced by submitters due to high traffic on the web server. Authors are therefore encouraged to submit papers as early as possible. Authors of manuscripts for overview papers and conference summary papers are kindly requested to submit their papers for publication in a special issue of the journal Nuclear Fusion to appear in mid 2014. The papers will be published by the IAEA as unedited proceedings in electronic format on a CD-ROM and on the IAEA Physics Section website (http://www-naweb.iaea.org/napc/physics/index.html) by March 2015. Authors should note that material which was not presented at the conference orally or in the form of a poster will not be included in the proceedings. Authors of papers accepted for presentation at the conference are encouraged to submit their papers to the journal Nuclear Fusion, in addition to submitting them for inclusion in the conference proceedings. The manuscripts must contain original work and should omit, or only briefly mention in the introduction, material that has already been published. Papers should be appropriate, in terms of style and content, for a high quality scientific journal and will be subject to the standard double-referee peer-review procedure observed by the editors of Nuclear Fusion. All communications with the authors regarding details for publication and charges will be handled by the Nuclear Fusion editorial office. -	A two-page synopsis has been sent as a file attachment by email to the IAEA’s Scientific Secretariat for the conference by 21 September 2014 (to this email address: physics@iaea.org and as PDF files only). The Programme Committee will meet on 13 October 2014 to consider post-deadline submissions. Authors will be notified promptly about the acceptance or rejection of their papers through announcements posted on the IAEA conference website. Authors of post-deadline papers should be prepared to provide either an oral presentation or a poster. Time will be made available for three post-deadline oral presentations. The manuscripts of post-deadline contributions are to be included in the proceedings and must follow the same guidelines as those that apply to regular papers (see Section E). The cost for the organization of the conference is borne by the Host Government and the IAEA. Designated participants who require a visa to enter the Russian Federation should submit the necessary application(s) to the nearest diplomatic or consular representative of the Russian Federation as early as possible, but at least one month before the start of the conference. An invitation letter from the local organizers will be required to accompany the visa application. Please see the “Visa Guidance” to be made available soon at the IAEA conference website (see Section P) on how to obtain such an invitation letter. Deadline for booking requests: 13 September 2014. Details regarding how to arrange for room reservations will soon be made available on the Host Organization Host Organization conference website. This will soon be available through the IAEA conference website.